Teeny Dwarf Mugho Pine is just that 'Teeny.' This is a dwarf conifer that in probably the smallest Dwarf Mugho Pine out there. It has dark green needles that hold their color through the winter. it will grow to a height of 6" to 1' and a width of 6" to 1'. 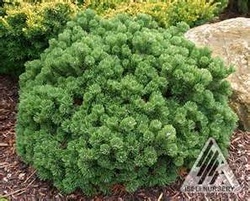 Use this dwarf shrub in a rock garden, miniature garden, container, or as a specimen. Teeny Dwarf Mugho Pine is also an excellent choice for a Bonsai specimen. It is also deer resistant and does best in full sun to lite shade.